Retired Army SSG Brian Mast served his nation for 12 years and was a member of the Joint Special Operations Command fighting in Afghanistan when his career was cut short by a catastrophic injury. Despite losing both legs, Mast lost neither his guiding values nor his warrior spirit. While he expressed regret that he can no longer serve as a soldier in the same capacity that he once did, he has not abandoned his desire to fight for what he believes are just causes. In a recent interview with Western Journalism, Mast explained that he will be traveling to Israel on Jan. 10 to fight alongside Israeli Defense Forces soldiers as a Sar-El volunteer. He noted that his motivation for making the arduous journey is complex and deeply rooted. Naturally, he added, his own military service played a major role in his gravitation toward this endeavor. He took the first steps to coordinate the trip, though, when he witnessed blatantly anti-Israel demonstrations on the campus of Harvard University, where he is a full-time student. Mast explained that Israel and the U.S. must be on the same side as both nations face very similar foes. Though many in the U.S. have turned their backs on Israel, Mast said Israel remains quite receptive to those willing to serve alongside its soldiers. Even those who do not make the commitment to travel to Israel can still do their part to support America’s ally from home, he said. As this will be his first trip to Israel, Mast is not entirely sure what he will find upon his arrival. Based on the company he will keep, however, there are at least a few constants he expects to hold true thousands of miles from home. Looking forward, he said that he would like to commit to a longer tour in Israel, noting that there are two main reasons he limited this trip to 12 days. In the end, Mast said his decision to continue fighting is because what he and others like him are doing transcends his own life. 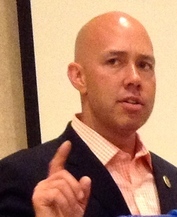 Retired Army Special Operations combat veteran Brian Mast has announced he's running for U.S. Congress. Mast, who served in the Army for twelve years and lost both his legs to an IED blast while serving as a bomb disposal expert in Afghanistan, explained on "Fox and Friends" why he's seeking the Republican nomination in Florida’s 18th congressional district. "When I think about serving in Congress, it’s for one very specific reason," Mast said. "I learned in combat and serving alongside great soldiers to my left and right that there’s only one way to serve this country. And that’s without regard for the personal consequence or without regard for person gain." "And I want to go to D.C. and inspire that in everyone that’s up there, because that’s what my brothers do on the battlefield." The seat will be vacated by Rep. Patrick Murphy (D-Fla.), who has announced he will run for Marco Rubio's Senate seat. Watch the "Fox and Friends" interview above and learn more about Mast in his campaign announcement below.